Yes it is fall, but that doesn’t mean you have to give up on cooking outside just yet…this grilled steak salad lets you extend this summer pleasure just a little longer. This salad features marinated grass-fed skirt steak, but you could also use flank steak or a top sirloin cut. Grass-fed meats have a very different (better!) nutritional profile than commercial meats. Eatwild.com has lots of information about why this is so. Marinating the steak for at least an hour tenderizes the meat and infuses it with flavor; marinating before grilling also helps to cut down on potentially carcinogenic compounds (known as polycyclic aromatic hydrocarbons) associated with grilled meats. If you don’t eat meat, you can still enjoy this salad; leave the steak off and use grilled fish or chicken instead; or keep it vegetarian and top with grilled vegetables, beans, sprouts, tofu or tempeh, etc. The arugula avocado salad is also delicious on its own, though you probably won’t want to use all the dressing. Mix lemon juice with other marinade ingredients and pour into a large glass bowl or resealable plastic bag. Mix well and add the steak, turning to coat on all sides. Allow to marinate for at least 1 hour or as long as overnight. Heat your grill to high. When the grill is very hot, grill the steak. It should take 4-5 minutes per side for medium-rare. Place on a cutting board and allow to rest covered with foil for a few minutes before slicing. 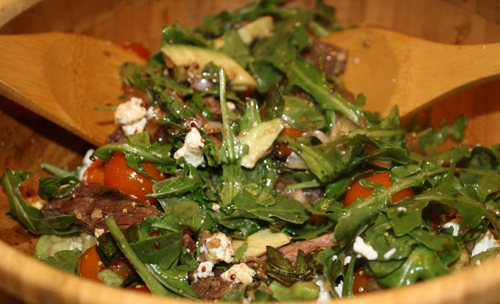 In a large bowl, toss the arugula, tomatoes, and avocado. Slice and add the steak (make sure to slice the steak across the grain, especially if it is flank steak). Pour the dressing over the salad and mix well. Garnish with the crumbled goat cheese. Season with sea salt and fresh ground pepper, if desired, before serving.